A cardiovascular workout – Jumping on a trampoline increases the heart rate and gives your heart, a very important muscle, a great workout. A workout for the muscles – A great workout for the feet muscles up to the stomach muscles occurs when bouncing on the trampoline for even a few minutes. Weight loss – The combination of cardiovascular exercise and the strengthening of the muscles contributes weight loss. As muscles strengthen they aide in the increase of the metabolism which helps to burn fat. The cardiovascular workout burns calories. By jumping on a trampoline for 20-30 minutes 3-4 times a week, weight loss can occur. Improved flexibility – Jumping on a trampoline strengthens and lengthens muscles improving flexibility. Increased bone density – Exercise can strengthen bone density as well as muscles. Increased bone density helps to prevent broken or fractured bones and osteoporosis. Improved joint, tendon and ligament function – The strengthening of joints, tendons and ligaments can help to reduce the chances of some forms of arthritis and lessen the pain in some arthritic joints. Development of balance and coordination - Balancing on a trampoline is unlike balancing on anything else. The trampoline floor is constantly moving and jumpers must be aware of their center of gravity at all times. The balance learned on a trampoline helps improve balance in other activities. Improved posture – Along with improved balance, jumping on a trampoline can improve posture. Development of motor skills – The brain is forced to function bilaterally when a jumper is in the air. Both sides of the brain and both sides of the body must work together to maintain coordination and balance when on a trampoline. This increases motor skills. Have an effect on academic success – By helping a child learn to control movement of the body, it can help a child learn. 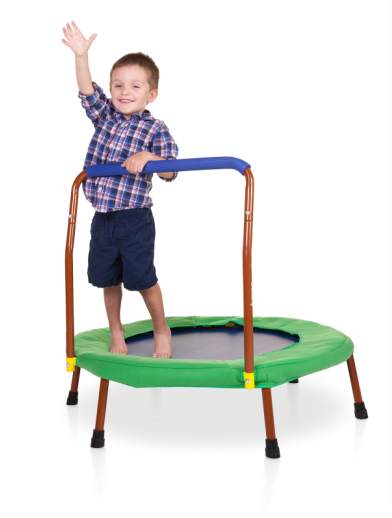 Because a trampoline teaches muscle control and coordination, many children see an improvement academically when regular use of a trampoline occurs. Improve self esteem – A child gains confidence as he masters new skills on the trampoline. This can translate into a better self image that may help improve academic success. Teach persistence – It often takes many tries to master a skill on the trampoline, but because it is so much fun a child will often persist. This can teach the important lesson that doing something right is worth the effort. The many benefits of jumping on a trampoline make it a fantastic activity for children, but it is important to remember that children should always be supervised when on the trampoline. Netted “cages” can be purchased that keep children from bouncing off and becoming injured. A low impact workout – A rebounder takes much of the stress off of joints that can get jarred with many other forms of exercise. A fantastic workout for senior citizens or those who are out of shape – Seniors and those who are out of shape can begin jumping on a rebounder and get results almost from the start. a person avoid psychosomatic disease and depression.